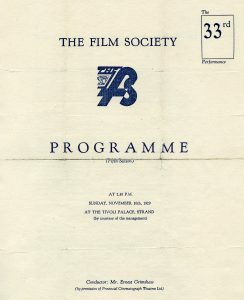 Programme for premiere of Drifters, Tivoli Palace, London, 10 November 1929. Example of contemporary press reaction to Drifters. Forsyth Hardy in his biography of Grierson notes that Eisenstein was present at the London premieres. He recalls a conversation between the two filmmakers after the screening. “Why,” said Eisenstein to Grierson, “you must know all about Potemkin.” “Foot by foot and cut by cut”, replied Grierson. 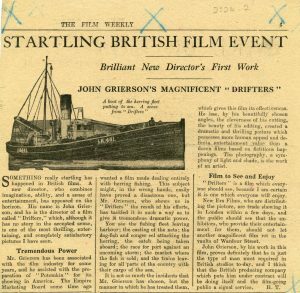 Our John Grierson Archive holds a wealth of material relating to Drifters including a water-damaged copy of the script for the film where the ink has run across the page. It’s tempting to imagine that the pages got wet when Grierson was on board the trawlers in the North Sea shooting the dramatic scenes of fishermen at work which feature in the film. 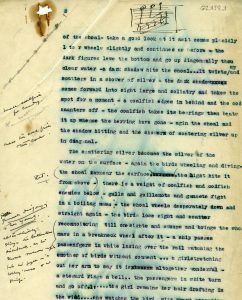 Water-damaged page of script for Drifters.